CRITICALLY ACCLAIMED progressive rock band Fusion Orchestra have released their first album in 45 years following a surprise encounter with a fan in Japan. The band – which was active between 1969 and 1975 – featured vocalist and multi-instrumentalist Jill Saward, who has enjoyed a long and successful career in the music industry and has been the 'front woman' for jazz-funk band Shakatak since the 1980s. Jill explains: “There I was in Tokyo in 2016 finishing the Shakatak tour, when a quiet discerning Japanese man called Yasuyuki Mizuno approached me at the merchandise table and said he has a cassette of a Fusion Orchestra show he attended at the Marquee London in 1974. “I found myself listening – with a nostalgic tear in my eye – to the set, shouting to myself 'yeah, go girl go!'. Screams and all. The band sound brilliant, the audience jibes and cheers add to the show. It's live, uncut and really very very raw. I was transported back to the Marquee and can smell the place now – and I can also feel the history that lived in the walls. 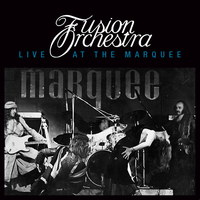 The album – Fusion Orchestra Live at the Marquee – features Jill on vocals, piano, flute, 12-string guitar and percussion; Colin Dawson on lead guitar; Stan Land (who sadly passed away early in 2017) on second guitar, slide guitar, harmonica and synths; Paul Jennings on bass guitar; and Dave Bell on drums. The recording has been taken from the original analogue source captured at the London's Marquee club on 26 August 1974. The track listing is 1: Beginning End. 2: Sister Reno. 3: Talk To The Man In The Sky. 4: To A Child. 5: Set In the Rock. 6: Spinedance + Drum Solo. 7: Skeleton In Armour. Plus two encores – a surprise version of the Beatles' Ticket To Ride and Whole Lotta Shakin'. Fusion Orchestra Live at the Marquee comes with a booklet including a gallery of band pictures and is available from all good record shops, including www.secretrecordslimited.com, and online from Amazon.